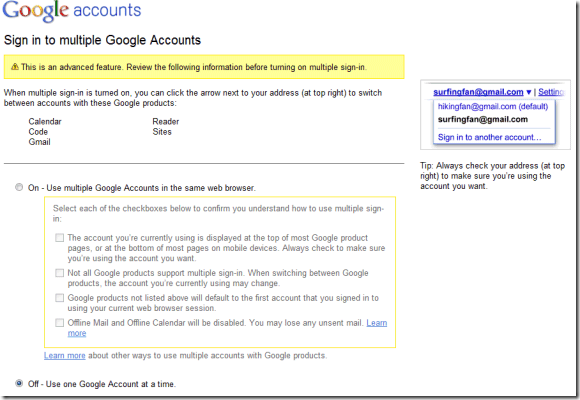 One of the most wanted features of Google is Multiple Login to different Google account at the same time. We cannot able to login to multiple Google account at the same time now, but in coming days we can able to do that also because Google releasing a new feature to Google accounts which enable us to sign-in multiple Google account at the same time. Multiple sign-in feature already available for few people and they using right now on their Google account. But when I test in my Google account this feature is not available for me. Today unofficial Google blog posted about this topic, where he is already using this feature with his Google account. You can see multiple sign-in option which is available at the top. Google already prepared a help section for enabling multiple accounts simultaneously. According this help section we can enable multiple sign-in by visiting multiple sign-in settings page. But when I tried to visit that page I got an error saying “The page you requested is invalid”. I think they have not providing this feature for all of them at now. Check whether your Google account is providing this new feature or not by visiting Google accounts page and multiple sign-in settings page. Other Google products and the mobile versions of the above products do not support the use of multiple accounts in the same web browser. Anyway most awaited feature of Google will be available in few days for all Google users so stay tuned for it. We will try to cover when it is available for all Google users, so don’t forget to subscribe to our blog. Google has been accept multiple login with all google account. But when I try it on my account it didn’t show that option to me. Yes, it’s working now 🙂 When I posted this post on that time this feature is not enabled in my Google Account. Already launched and now available for everyone, you can check it in your Google Account settings to enable it.